The KODAK Photo Printer 6850 delivers durable, photographic-quality prints in seconds. In just 15 seconds, the digital thermal Photo Printer 6850 can print a high-quality, borderless 6x8-inch glossy photograph that resists water and lasts a lifetime; it can print 4x6-inch prints in 8 seconds. Efficient, the Photo Printer 6850 can output 375 6x8-inch (15x20 cm) or 5x7-inch (13x18 cm) prints or 750 4x6-inch (10x15 cm) prints, without operator intervention. With more printer uptime, and less labor downtime, the Kodak Photo Printer 6850 is a powerful, cost-efficient business tool. The Kodak Photo Printer 6850 offers a USB 2.0 interface with USB 1.1 compatibility, for fast data transfer on a standard PC. No expensive SCSI card or cable is required. You can even gang multiple printers from the same PC for faster effective speeds. Combine its built-in cutter with its high speed and you can confidently provide "while-you-wait" printing to gain more sales. Print drivers interface directly with PCs and laptops, making for hassle-free portability. 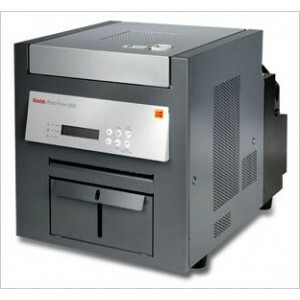 And the Kodak Photo Printer 6850 operates faster than most similarly priced competitors' thermal and inkjet printers, so you can print more for your money with the Kodak Photo Printer 6850. Fast: Photographic-quality prints in seconds. Versatile: 6x8-inch (15x20 cm) or 5x7-inch (13x18 cm) prints in just 15 seconds; 4x6-inch (10x15 cm) prints in 8 seconds. Efficient: 375 6x8-inch (15x20 cm) or 5x7-inch (13x18 cm) prints, or 750 4x6-inch (10x15 cm) prints, with no operator intervention needed. Effective: More customer transactions in less time. Durable: Water-resistant prints that last a lifetime. Easy to install and operate: One PC can operate multiple printers. Maximum Printable Area Borderless 6x8"
Borderless Photo Sizes 4x6" & 6x8"